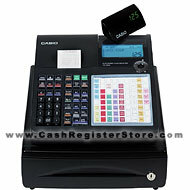 Casio TK-950 Electronic Cash Registers at Cash Register Store. This register package includes a black Metrologic MS-9520 laser scanner. The newly released Casio TK-950 electronic cash register comes packed with many features and a new piece of innovated technology. 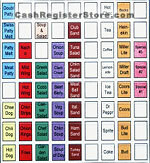 Casio is the first to manufacture cash registers with anti-microbial (anti-bacterial) technology. Why are anti-microbial keyboards a great benefit? Simply because hands and fingers are a common way of transmitting harmful bacteria and diseases and because many different people touch a cash register keyboard every day, this technology is perfect to aid in the control of reducing the spread of disease and sickness in the workplace resulting in fewer sick days. To read more about this new anti-microbial technology, click here. Being of a small footprint and low weight, the TK-950 is perfect for a kiosk, small restaurant or as a general starter cash register. This cash register comes with a stylish black design and features a 3 line emerald LCD display, high speed thermal printer, hybrid keyboard with raised keys on the left and 72 flat spill-resistant preset keys on the right, 2000 plu's and a small compact cash drawer with a media slot.